X Japan mainman Yoshiki was on hand to help celebrate the news that the 2016 Classic Rock Roll Of Honour ceremony will be held in Japan. 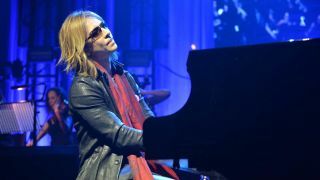 Yoshiki performed a piano-led version of his band’s hit Without You as well as a cover of Queen’s iconic Bohemian Rhapsody at tonight’s Classic Rock Roll Of Honour ceremony at the Roundhouse in London. And as the Japanese star got ready for his performance, TeamRock editor-in-chief Alexander Milas, aka The Dark Lord – announced that next year’s event will be held in Tokyo. Milas said: “Music is truly a universal language, nowhere is it spoken more fluently than in Japan, where for decades recorded documents of the greatest live shows of our age have become essential listening for rock fans all over the world. Deep Purple, Ozzy Osbourne, Iron Maiden, and Cheap Trick among many others have stepped into the realm of legend by touring there, and we’ve decided it’s about time that Classic Rock magazine did the same. “TeamRock is about reaching those who support this music no matter who they are, or where they happen to be in the world. Times change, but what is certain is that it has been and always will be about the fans. “In keeping with that promise, it’s my distinct pleasure to announce that next year, we will be bringing this celebration of the great and good of our world to Japan. In 2014, the Classic Rock Roll Of Honour was held at the Avalon club in Los Angeles. X Japan announced will next year release their first album in 20 years and they will play at Wembley Arena on March 12, 2016 – the day after the album launch. Keep up with all the news from tonight’s ceremony via Classic Rock’s live blog.